Wonderful Puzzle Game "Picross pro". Picross pro is a good exercise to your brain! 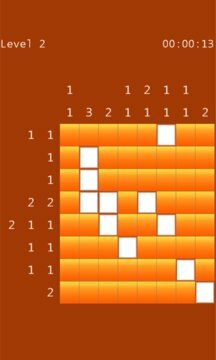 it is a logic puzzle. This is pixel cross of nonograms type game. This is a Logic puzzle in which cells in a grid must be colored or left blank according to numbers at the side of the grid. In this puzzle type, the numbers are a form of discrete tomography that measures how many unbroken lines of filled-in squares there are in any given row or column. For example, a clue of "2 1 3" would mean there are sets of Two, One , and Three filled squares, in that order, with at least one blank square between successive groups. 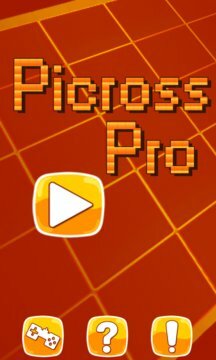 How to Play Picross Pro ? Step 1- The typical Picross layout is a grid with numbers surrounding it. The numbers are clues to the picture you're gonna make. The numbers on the left give clues about the horizontal rows, the numbers on top give clues about the vertical rows. Step2- The numbers tell you how many tiles are colored on that row, and how long the strings of colored tiles are. For example if the numbers say '111' then there would be row of 3 tiles colored, with at least 1 space empty between them. Step3- When the numbers say '5' for example, then there is a row of 5 colored tiles without a black space between them. Picross pro could be very addicting. Are you ready for the challenge ?